Thanks to a tip from a fellow muddy-kneed photographer, I was able to (finally!) 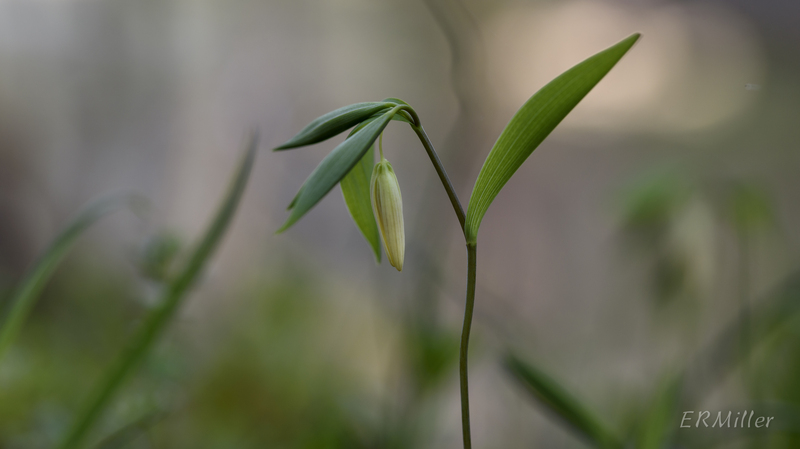 get some decent pictures of sessile bellwort. 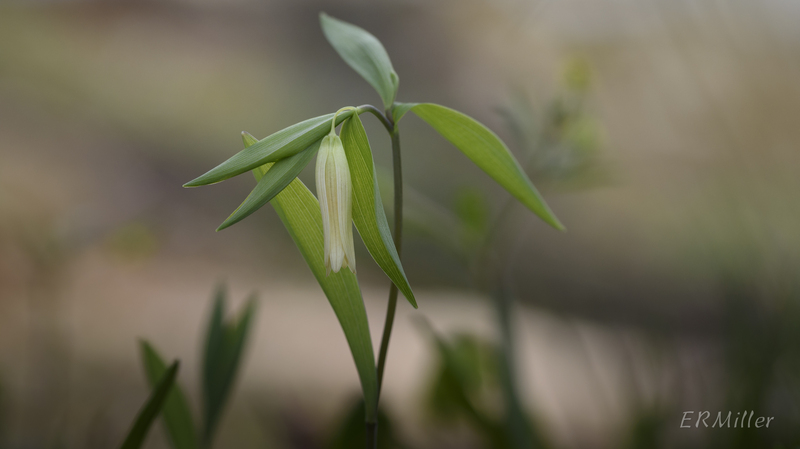 This is a dainty plant, standing only a few inches tall, with a few narrow leaves and an inch-long, pendant, pale yellow flower. It can be found in moist woodlands in the eastern US and Canada, the Midwest, and parts of the Great Plains states. 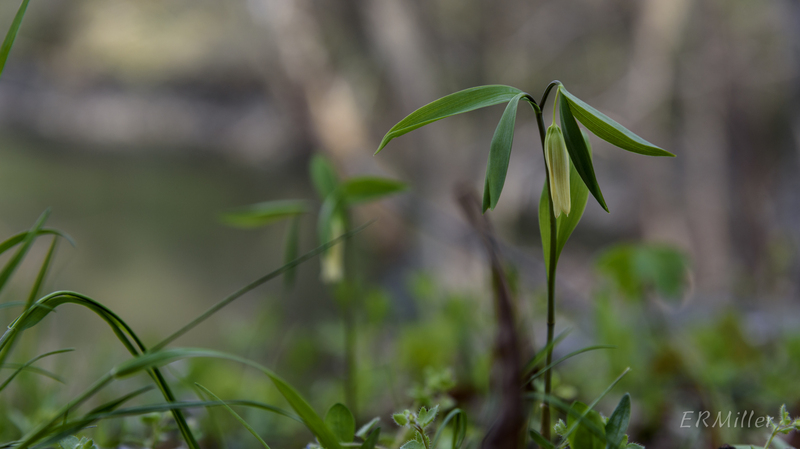 Like so many of the other plants now blooming in the Gorge, it’s an ephemeral: in about a month it will be done for the year, and die back to the ground. In 2012, I hiked the Billy Goat trails for fun and to see the flowers. In 2013, I started taking pictures of them with my iPhone, so I could identify them at home. In 2014, I bought my first real camera (Nikon D3200) to use as a tool for better identification and study, but my goal was finding the plants. Midway through 2015, I bought a better camera (Nikon D750), because my goal had shifted from finding plants to getting better pictures of them. Now, in 2016, I find I’m no longer hiking in search of plants. Rather, I’m hiking to places where I know certain plants can be found, in order to spend time taking pictures of them. I’ll be posting about another one of those soon. Funny where a trail can lead you if you let it. I had never been interested in photography before. What lens(es) are you using for your flower pics? Are you happy with your D750? Most of the time I shoot hand-held with the kit lens, which is a 24-120. The pictures in this post I took with a tripod and a Sigma 105mm macro lens. I think it can be tricky to work with but that’s probably me being impatient. The image clarity is excellent when I take the time to do it right. As for the D750, I’m mostly happy with it. It has quirks. For one thing, the autofocus is sometimes so sensitive that I can’t focus exactly where I want to, and have to go hunting for something contrasty in the same focal plane. And then half the time it doesn’t focus where I want it to, anyway. However, when it’s on a tripod and I’m manually focusing and using a remote shutter release, the results are great. Image clarity is excellent. I use the pop-out monitor screen a lot.